Thinking about buying a new home? Now might be the right time! 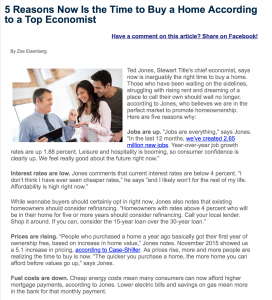 Ted Jones, Stewart Title’s chief economist, says now is inarguably the right time to by a home. Those who have been waiting on the sidelines, struggling with rising rent and dreaming of a place to call their own should wait no longer, according to Jones, who believes we are in the perfect market to promote homeownership.